Save money and order direct from the trouser and skirt hangers manufacturer. We produce plastic clothes hangers in our factory in Ireland. Why pay more to a wholesaler? Buy both plastic trouser hangers and plastic skirt hangers straight from the manufacturer. Also, order handy pack sizes starting from just 10. Need more hangers? No problem! Choose larger pack sizes of 50, 100 and also box quantities. 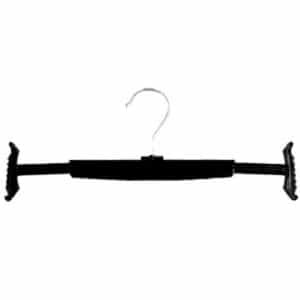 Order our 32cm wide H9 hangers to hang trousers. Also, referred to as plastic fold trouser hangers and made with a strong and durable metal hook. Simply fold trouser legs over the trouser bar and secure them over the lower half bars. As a result keep adults trousers neat and ready to wear, without creasing. Moreovever, hang up lots of trousers in your wardrobe due to the flat, space saving design of the H9. 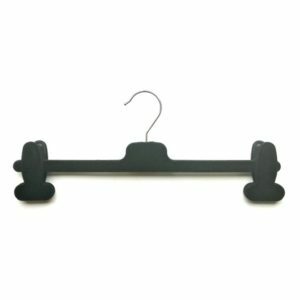 Hang both trouser and skirts with our range of plastic clip hangers. 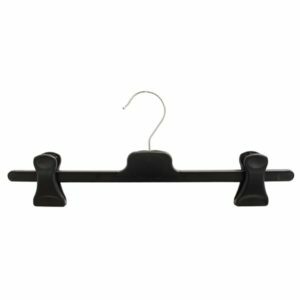 Choose either our 34cm wide or larger 38cm clip hangers. Use the strong plastic clips to secure trousers and skirts in place. The clips do not damage garments because they have a soft rubber surface. In addition, hang garments of different sizes, including shorts, because of the adjustable clips. Simply slide the clips along the bar to fit the width of trousers or skirts. Buy our 38cm wide S38 to hang adults trousers and skirts with elasticated waists. In addition, use the side grips on the S38 to secure multi-size garments with elasticated waists. Moreover, order the S38 in black and natural. 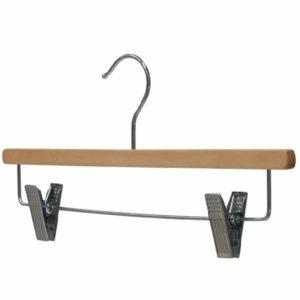 Hang extra large elasticated waist trousers and skirts using our 52cm and 64cm wide hangers with spring. Use the side grips to secure garments in place. Choose our stylish 34cm wide velvet trouser hangers to display your finest trousers. Also, use flocked clip hangers to hang skirts. Secure garments using the strong clips without marking fabrics. In addition, hang trousers and skirts of different sizes by simply sliding the clips along the bar. Use wooden clip hangers to hang heavy garments such as jeans or denim skirts. Also, made with strong chrome hooks for extra strength. Choose from WC35 and WWC35, both 35cm wide. Buy the WWC35 to hang very heavy garments because the wider, padded bar is extra strong. Perfect also for retail display. Another name for wooden clip hangers is wooden trouser hangers. 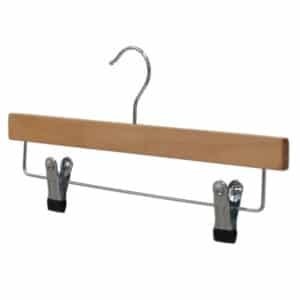 Purchase stylish laminated trousers hangers to display your finest trousers and skirts. As a result of their laminated wooden finish and strong metal clips they are perfect for retail display. Use skirt hangers to display your favourite skirts. Secure garments using the adjustable strong metal clips. 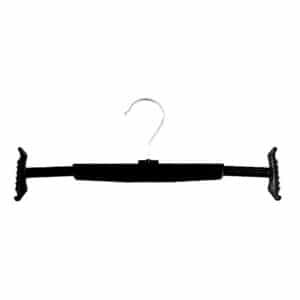 Also, choose between satin hangers in black, cream and red, all 43cm wide. 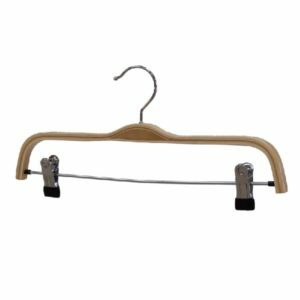 Order wire trouser hangers and skirt hangers to hang garments at low cost. Also, choose between bronze, silver and white notched wire hangers. Slip skirt loops over the shoulder notches to hang skirts. Place cardboard trouser guards over the trouser bar on wire hangers to prevent trousers from slipping off. Use printed trouser hangers skirt hangers to promote your brand. 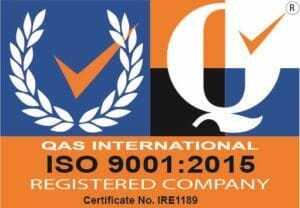 We print your logo on the central oval label area in one colour. Branded hangers are subject to minimum order quantities of 10 boxes. Find out more by visiting our printed hangers page. 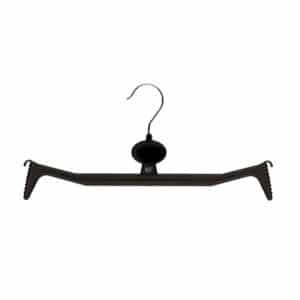 Ordering trouser and skirt clothes hangers is simple on hangers.ie. Order and pay in only a few clicks using our super fast, secure PayPal Express checkout. Also, get free delivery to Ireland and UK on all orders over €75 + VAT (or Sterling equivalent)!